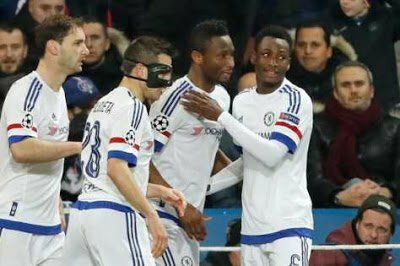 Chelsea midfielder John Mikel Obi may be in line for a new Chelsea contract, following his impressive performance under Guus Hiddink. Mikel’s resurgence under Guus Hiddink has altered his situation at Chelsea with the club now considering the offer of a new deal. The 29-year-old Nigerian hardly had a look in Jose Mourinho, who preferred Cesc Fabregas and Nemanja Matic as regular partners in his defensive midfield. But since Hiddink was brought in as interim coach following Mourinho’s exit Mikel has featured more regularly. And such has been his form, and the fact he has proved he can be called upon at any time to do a job for the team, that the Blues powerbrokers are now giving real thought to the offer of a contract extension. Mikel, who joined Chelsea from Lyn Oslo in controversial circumstances 10 years ago, has 15 months to run on his current deal. The midfielder bagged a rare but potentially vital away goal in the 2-1 defeat by Paris Saint-Germain on Tuesday in the first leg of the two sides’ Champions League last-16 clash.